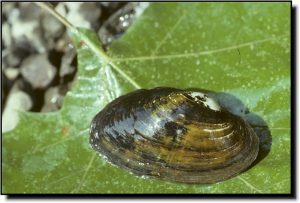 The species is extremely wide ranging being one of the few North American mussels to occur on both sides of the Appalachian Mountains. It is distributed throughout the Mississippi River and Great Lakes systems, northern Atlantic Coast drainages, parts of the Canadian Interior Basin and as far west as Texas and Saskatchewan. Presumably, it occurred throughout the Tennessee River system historically. In Alabama, it reaches its southern limit in a short reach of Bear Creek, Colbert Co., where it may not be viable, otherwise it is considered stable throughout its wide range. Comments: The creeper has a thin, oval-shaped shell that causes the mussel to feel light for its size. Young shells are frequently yellow, rayed with green, turning dark brown to black with age. Internally, the nacre is also variable in color from cream to white, bluish-white or even salmon-colored. The lateral teeth are reduced and do not interlock. 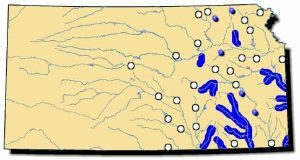 The creeper resides in most southeast Kansas streams with permanent flow. Some research suggests this species’ glochidia do not require a fish host, but they will attach to a fish if given the opportunity.